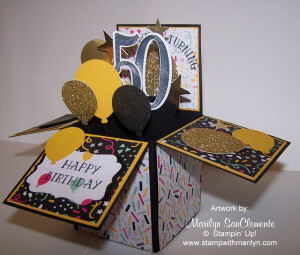 Today I am sharing a really cool Pop-up Box card with a Birthday Card theme that I made for a friend’s 80th Birthday. I know this card has a 50 on it since this is now my sample card. So the theme for the Stamping New England Design Team cards in February is Birthdays. 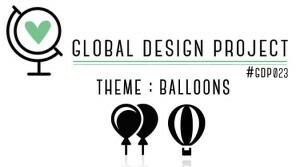 And this week the theme for the Global Design Team challenge is balloons. So here we are! My first entry for the Global Design Project! So the Details on this card. The base of the card is Basic Black cardstock cut to 5 1/2″ x 11″. 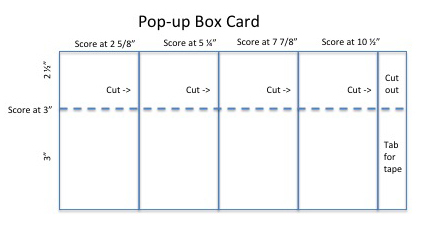 I made a little cheat sheet of how to cut and score card stock for the base of this really cool card. Score down the middle the long way at 3″. Then score at 2 5/8″, 5 1/4″, 7 7/8″ and 10 1/2″. Cut up each score line on the 2 1/2″ side to the score line in the center of the piece. Then fold and cut out the 2 1/2″ x 1/2″ piece. Use a piece of Tear & Tape strip on the small tab that is left. Fold into a box. Fold down the flap on each side. Next I layered each side of the box. I used the It’s Your Party designer paper stack layered onto Crushed Curry cardstock for the sides. I choose the white confetti pattern for the back piece so I could stamp the message “Look who’s turning” from the Number of Years stamp set with Black Momento ink. The dimensions for these layers are: Crushed Curry 2 1/2″ x 2 3/8″ and the Designer paper is 2 3/8″ x 2 1/4″. Next punch out balloons from pieces of crushed curry and basic black cardstock using the new Balloon Bouquet punch from the Stampin’ Up! Occasions catalog. I also punched out a few balloons from Gold Glimmer paper and Gold Foil for a little extra bling! Next were a few stars punched out using the Star punch. Then stamp the desired number of years using the new Stampin’ Up! stamp set Number of Years and cut out with the matching framelit dies. Don’t you love when Stampin’ Up! designs dies to cut out stamped images? To attach the balloons and numbers to the center of the box, cut 2 pieces at 3/4″ x 3 5/8″ and score 1/2″ from each end to make cross bars for the box. Fold each piece in a Z fold. Add a little piece of Tear & Tape strip to the end of each Z. These then fit into the Box attaching each piece to the side of the box to make two cross bars. Next cut little stems from scraps of cardstock. I took a 3″ scrap of cardstock and cut very narrow 1/8″ pieces to make the stems which I used to attach the balloons, stars and numbers to these little crossbars. I have recorded a video of this project. Check it out HERE. Marilyn, this box card is just exploding with happiness! Thanks for joining us for our balloon challenge this week at Global Design Project! So fun! A fiftieth birthday deserves such a wonderful card. Shows how much you care. Love it! I’m so glad you played along with this week’s Balloons Theme Challenge at the Global Design Project – thanks!